The commemoration of the sinking of the SS Mendi in the English Channel in 1917 in which more than 600 South African soldiers perished forms part of the activities of the SANDF’s Armed Forces Day in Cape Town on Thursday. The annual event has been held in different provinces since 2013. The Western Cape is the seventh province to host Armed Forces Day. Spokesperson, Brigadier General Mafi Mgobozi, says the main aim is to honour those soldiers who died in the line of duty and those who continue to serve in the army. 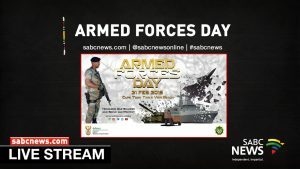 The post WATCH: National Armed Forces Day appeared first on SABC News – Breaking news, special reports, world, business, sport coverage of all South African current events. Africa's news leader..